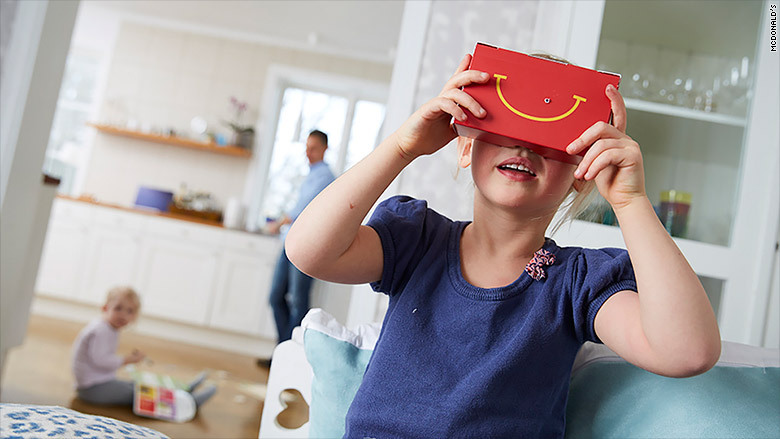 O'Neill reports that a Swedish McDonald's is featuring Happy Meals that include Happy Goggles, a virtual reality toy that works with the help mom or dad's smartphone. The newest take on the iconic Happy Meal box can be folded into VR goggles. Happy Goggles are being introduced to celebrate the 30 year anniversary of Happy Meals in Sweden, and to modernize the classic kids meal. Her article reported that two child psychologists, Karl Eder and Fadi Lahdo, evaluated the goggles designed for children and provided recommendations to McDonald's for their use. "New generations are growing up in a world where smartphones and tablets are a natural part of life. Happy Goggles opens the door to virtual worlds, which of course is very exciting," the statement said. Kids will need to use mom or dad's smartphone to make the Happy Goggles work. McDonald's Sweden is the first McDonald's (MCD) to create and disperse the virtual reality tool. The company is also simultaneously launching a virtual reality ski game, that families can play using the goggles. "Now we want to try to add a digital experience that focuses on play and learning," McDonald's Sweden senior marketing manager Petra Dahlman said in a statement. The CNN Tech article reports that Happy Goggles will be available at select Swedish McDonald's stores in March 2016.